I was reading a post in our Community Forum that mentioned the Bily Brothers.They were farmers who lived in Iowa from the late 1800's to the 1960's. Frank and Joseph spent the long and cold Iowa winters making incredible clocks with a few hand tools and a home made scroll saw. The scroll saw was a converted sewing machine. The clocks were not made for sale but their sister would charge a dime for visitors to tour the collection. After their death the collection was donated to the town of Spillville, Iowa where they remain today in a small museum. 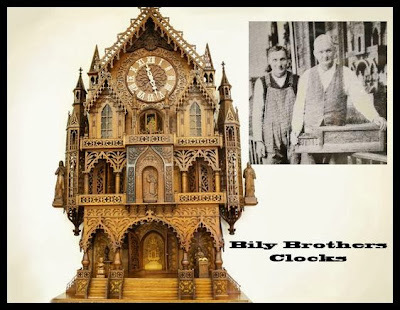 The Bily Clocks Museum web page. The two videos below with give you a nice background of the brother and their incredible talent. 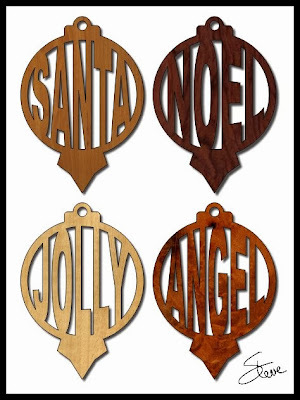 Christmas Word Ornament Scroll Saw Patterns. If you plan to do an arts and craft show this holiday season let me make a recommendation. Take a nice selection of Christmas ornaments with you. These things are almost guaranteed to sell. You want to keep production costs down and production rate high. The number one way to accomplish this is stack cutting two or three ornaments at a time. It's also a good idea to use a few species of woods to vary the color of the ornaments. You can cut them from 1/8" thick or 1/4" thick woods. It's easier to stack cut more of the 1/8" but I personally like the look of 1/4" thick ornaments. Display them at the show like jewelry. Have a nice display. Display only one of each ornament and label them as hand cut Christmas ornaments, sure to become a family heirloom that will be passed down through the generations. I like to include a sheet of paper with each ornament telling the species of wood along with a couple of facts about you as an artist. Make sure to include you telephone number or email address for extra orders. If your buyer goes home an shows a friend it's very possible you will get a few word of mouth orders. This pattern book has 12 different Christmas word ornaments. I also have many more in my catalog.